A career in public school teaching has provided the emotional motivation to create this collage. Theresa expresses through images and words,the victimization of children caused by bullying, neglect and abuse. This work is an effort to bring attention to the struggles and resilience of the female adolescent, and to give a voice to those compromised by others. 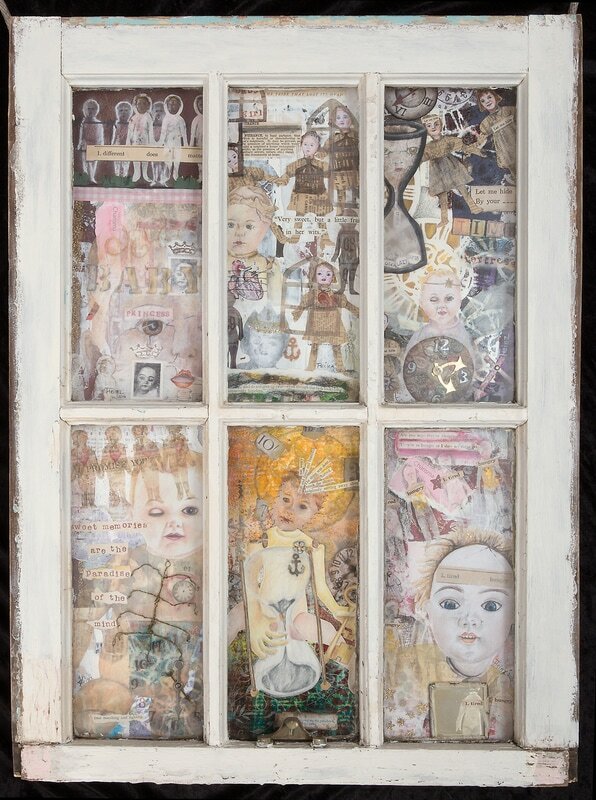 This piece attempts to capture the innocence of youth, the delicate form of the human body and mind and the destructive results from powers beyond a child’s control. The archetypes of broken dolls and time serve as metaphors for the abuse, neglect and maltreatment of children and the denial of a deservedly joyous, carefree childhood, caused by these issues. A cacophony of disturbing images evokes a startled response. Both doll and child are beautiful, fragile and vulnerable, we don’t expect to find them compromised or damaged. Theresa anticipates that the viewer will be drawn into the work both figuratively and literally by virtue of the scale and content of images and words.